This blog post is cross-posted from Spatial Collective’s blog. 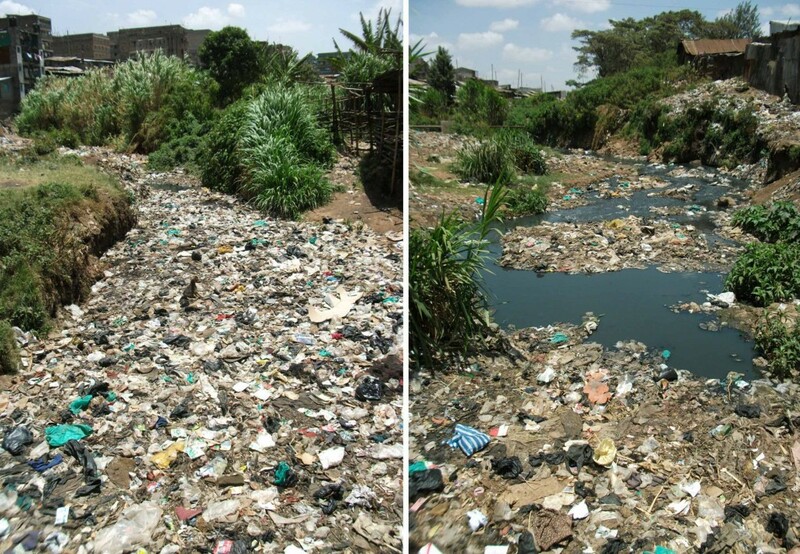 Garbage collection is a major problem in Mathare, a conclusion easily confirmed by even the most casual observation (Mathare river pictured above). The problem of inadequate waste management in Mathare is no less than an environmental and humanitarian disaster. Waste is everywhere. Food waste, paper, broken bottles, batteries, metal, plastic, electrical material, building material, raw sewerage, paint and other chemicals, even human feces litter walking paths, open spaces, roads, and even people’s houses. These are the things one can see. Then there are the unseen — though usually smelled — toxins created by open-pit burning and the overflowing waste from the open-drainage. A waste management system appears to be non-existent. There seems to be little question that the health implications for the people living in these conditions are disastrous. The team at Spatial Collective is trying to get a better understanding of waste management challenges in Mathare so that we can work with residents to find appropriate solutions. We are determined to implement a campaign to clean Mathare and improve the existing waste management systems found in the community. The inspiration largely comes from Isaac Mutisya, also known as Kaka, and his youth group Mathare Environmental. Kaka was recently featured in a story on NPR about his role as an “activist cartographer” at Spatial Collective. His group managed to take over an open space in the middle of Mlango Kubwa, which was being used before as an uncontrolled dump site. 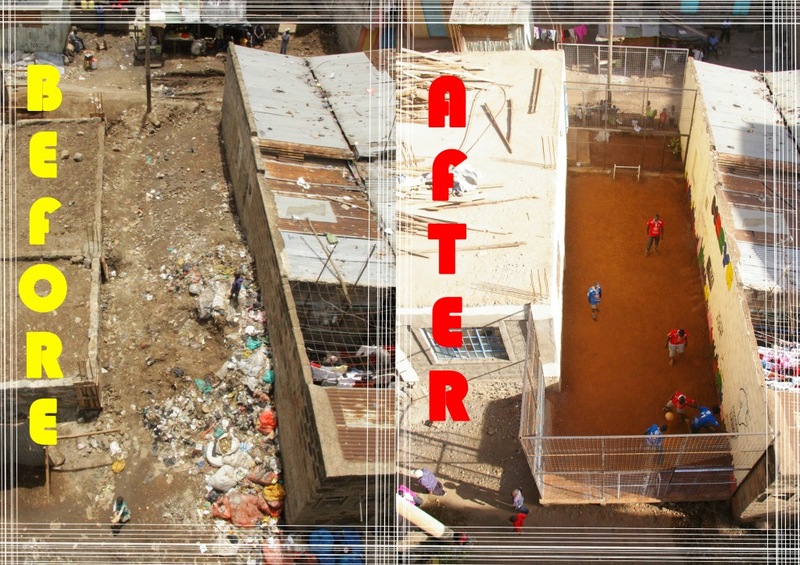 He and his team transformed it into a community center equipped with a small football pitch (picture below). Improving waste management is not just about cleaning dumps sites. Apart from being a health hazard, waste represents an important source of income for many groups and individuals. According to Kaka, due to lack of employment, many youths took on waste management as an opportunity to earn much needed cash. Recycling plastics, for example, earns a bit of money for cash-strapped youth. The waste management system in Mathare might be broken but it does exist. One might not agree with the way things are done but it has to be taken into account that some sort of a system exists. That is why, in order to avoid the potential conflicts and to propose the best solutions possible, we need to first understand the problem. Why waste management? Out of all the problems that the people of Mathare face day to day, solving a problem of accumulating waste seems the least complicated to solve. The problem is right there, in-your-face, visible, out in the open. At the same time the effects of the intervention should be quickly visible making them easier (but by no means easy) to measure – there are either less, more or the same number of uncontrolled dump sites in the community. The campaign has three parts: problem definition, designing of proposed solutions (offline and technological), and campaign implementation. We will start with defining the problem and setting of our goals. Our work will commence by conducting a preliminary public opinion survey. Professor Steven Livingson of the School of Media and Public Affairs at the George Washington University is advising us on the design of the survey questionnaire and in setting up the initial strategy. We will continue by categorizing waste management issues for the purpose of documenting and mapping them. In the end we will conduct the mapping of stakeholders and power relations between them which are currently present in waste management in Mathare. We hope that these steps will give us better insights into waste management in Mathare. These insights will lead us in our next two steps: designing solutions (including introducing potential technological solutions) and actual campaign implementation. This campaign will serve as a testing ground for all the future campaigns that Spatial Collective wants to undertake in informal settlements. As we learn what works, we will incorporate the lessons learned in our other project designs. We are hope to identify the most effective strategies for promoting development, in this case waste management. This is the first post in a series of many in which we will document our progress. We ask anyone to provide us with feedback or to give us advice in order to ensure that we do this campaign responsibly and effectively.